Feels like we’re kind of in the calm before a storm. There’s a sense of pent up energy just waiting to be unleashed and the only question is how it will all unfold in two days, what kind of damage will be done. It’s a schizophrenic time filled with high moments of excited hopefulness followed by lows that are comprised of doom and gloom. I dislike both the highs and lows of this time. The highs because I fear I am just kidding myself in thinking that the best thing might happen and the lows because of the future the worst case scenario presents. All in all, it leaves me, and I think a great many others, exhausted from walking this ragged edge of social/political schizophrenia. So finding this video this morning was just what the doctor ordered for me. I don’t exactly know how I got to it. I started with watching Lola from the Kinks, moved to a Spanish group named Cafe Quijano doing a song called La Lola— great song, kind of sexist video–then took a couple of turns and there was this. 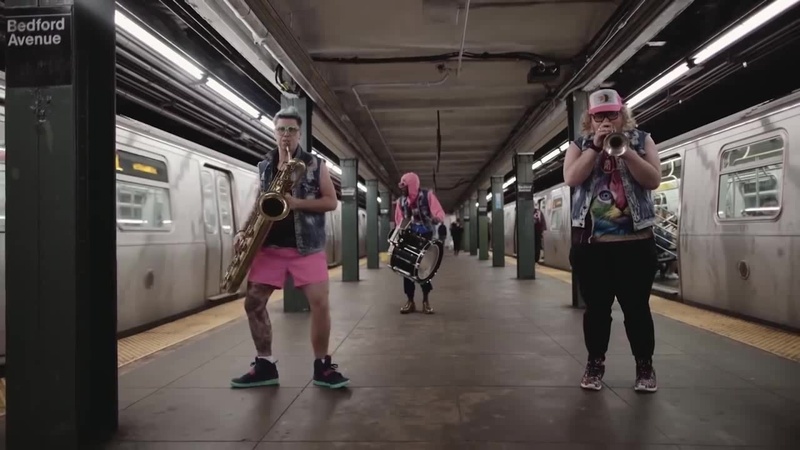 It’s from a group called Too Many Zooz. It’s three guys– Matt “Doe” Muirhead on trumpet, Leo P on baritone sax and David “King of Sludge” Parks on percussion– who started performing as subway buskers in NYC. Their call their genre of music brass house, a mix of house music, Afro-Cuban, and jazz. I think we can dispense with labels and just say that it is high energy. They have taken off in recent years as a result from a video that went viral that was shot by someone watching them perform on the Union Square platform in NYC. They have performed around the country and in Europe and Leo P, now widely known for his frantic dance moves, even did a performance on the BBC Proms with a full orchestra. They are currently on a European tour but will be back in the states next month. I see they are appearing not too far from me at The Haunt in Ithaca in December. This video is called Bedford and was shot on the Bedford subway platform in Brooklyn at 3:33 AM. If anyone was thinking about going to bed at that point, this most likely woke them up. So, if you find yourself in need of a pick-me-up, take a look at this. Then take that energy and get out there and vote. Vote. Vote. VOTE.